Everyone with a car needs to know how to safely jump-start their car battery. You can prevent serious injury to your eyes by following these 10 simple suggestions. 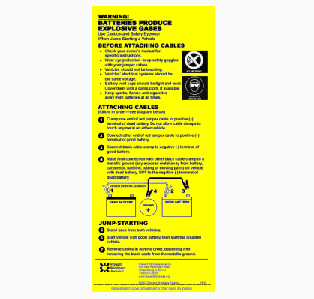 Request a free Prevent Blindness America's Battery Jump Start sticker - for quick reference in your car or garage. QUICK FREEBIE TIP:Keep an attitude of gratitude. Freebie hunting is more of a game of being at the right place at the right time - if you get the freebie, you won!